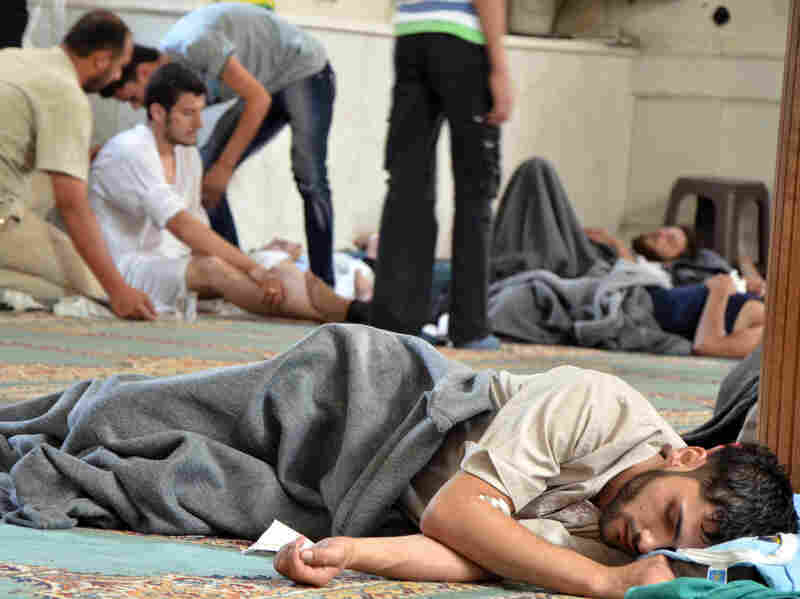 Syrian Doctors: Desperate Patients Flooded In At 3 A.M. : Parallels The doctors say they don't know exactly what caused the casualties, but they describe hundreds of patients descending on their hospitals, all suffering from similar symptoms. Syrian Doctors: Desperate Patients Flooded In At 3 A.M.
A young man is treated at a hospital Wednesday in the Duma neighborhood of Damascus, Syria. According to activists, he was one of many casualties in what they say was a chemical weapons attack by government forces. The Syrian government has denied using such weapons. In the early hours of Wednesday morning, Syrian civilians suffering from convulsions, nausea, vomiting and shortness of breath began streaming into hospitals in the Eastern Ghouta area just outside Damascas. Two doctors who were on duty at two different hospitals described what they saw to NPR's Rima Marrouch, who reached them from Beirut. Dr. Abu Yazan was working an overnight shift in a field hospital in Eastern Ghouta, outside the capital, Damascus, on Tuesday night and into Wednesday morning. "We were preparing for a normal flow of work," he said, adding that it was a warm night so people were sleeping with their windows open. At another hospital in Eastern Ghouta, the situation was similar, according to Dr. Majed, a doctor of general medicine. Both he and Abu Yazan asked that their full names and hospitals not be used because of the sensitivity of situation. "We usually have approximately 140 patients a day but we were not prepared for what happened," Majed said. At around 3 a.m., patients started streaming in from neighborhoods in suburban Damascus like Zamalka and Ain Terma, they both said. "Over several hours, we had 630 patients with shortness of breath, suffocation, bronchial secretions, sweating, convulsions, nausea, vomiting, a slow heart rate and cardiac arrests," said Majed, adding that many patients could not be saved. Sixty-five died at his hospital, just one of many in the region, which now includes many field hospitals set up to help those injured in the country's civil war. According to estimates by doctors in the area, hospitals in Eastern Ghouta received some 3,000 patients on Wednesday. The Associated Press cited Syrian opposition groups as putting the death toll at everywhere from 136 to 1,300. The figures cannot be independently confirmed, but video footage has shown large numbers of dead civilians. The opposition says government forces used chemical weapons, a charge the government denies. The U.S. State Department said Thursday that it was investigating but could not "conclusively determine" that chemical weapons were used. Both Abu Yazan and Majed say laboratory tests are needed to determine what caused the casualties. However, based on symptoms of the patients they treated, they believe the most likely cause was a sarin gas. Many of the facilities treating the patients have run low or are completely out of the most basic supplies. "There was a moment on Wednesday when one of the medical centers in Eastern Ghouta contacted us and asked us to send them IV bags, one of the most basic things you can have. They didn't have even that," said Majed. They also lacked more sophisticated equipment, such as ventilators, which were desperately needed. "If we had better equipment and supplies we would have saved more lives," Majed noted. Given the limited resources, the staff took off the contaminated clothes of the patients and washed them with soap and water. They were then treated with medicines that included atropine and hydrocortisone, Majed said. Majed said a number of terrible images stuck with him. "It was seeing the horror in the eyes of the patients," he said. "It was, for me, worse than seeing dying patients." At one point, a 3-month-old girl was brought in. The medical team was unable to save her. "What is the purpose of killing a 3-month-old child or other children killed in the attack?" he said. "What do you gain from killing a 3-month-old child?" For Abu Yazan, the worst moment was when a young woman came looking for her family members. "She found her mother and her two children among the dead," he said.